After welcoming Multi-Role Aviation Training Vessel (MATV) MV Sycamore to Sydney, Offshore Patrol Vessel tenderer Damen says it is already gearing up for the next phase of its bid for the $3 billion OPV contract. Damen representative Mark Todd told Defence Connect after the success of the company's industry roadshows earlier this year, Damen has already reached the next stage of its bid for the lucrative contract. "We conducted our industry roadshows in February as a part of gathering Australian industry content and maximising that for our tender response," said Todd. "The briefs were a great success and demonstrated the significant interest in the SEA 1180 program from a broad range of industries. The 850 attendees were provided with access to an ICN portal with 69 work packages available for Australian companies to respond to. "This portal generated 1,124 expressions of interest with Australian companies quoting for work that we will perform if we are selected to build the OPVs. " And many Australian companies would be more than hoping to do business with Damen, with more than 200 vessels being built by Damen every year, providing Australia's SMEs a strong opportunity to break into the international export market. "The recent welcoming ceremony for the MATV provided the perfect opportunity to show our key suppliers and their Australian partners, many of whom responded to the work packages released in February, what we expect of our partners and also to commence building the teamwork which is so important to delivering a complex shipbuilding program. The MATV is an excellent ship designed purely to meet Navy requirements and based on a Damen OPV 2400 design – clearly an excellent template for the SEA 1180 program. "So we consider we are at the next level of engagement. We've done the roadshows, we know who we want, what we want. We've done a lot of classification of the companies that responded to our industry briefs and our ICN portal. So now our key global suppliers have teamed with Australian companies and we are ensuring we maximise the Australian content." 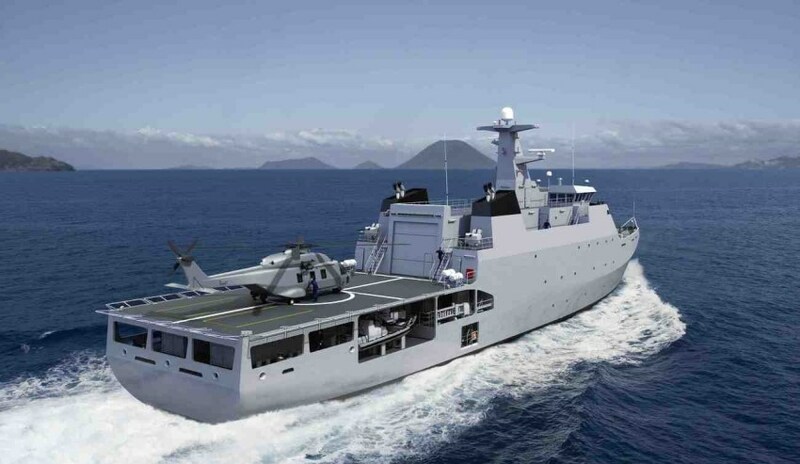 Damen, like its competitors Lürssen, has teamed with ASC and Forgacs (Civmec) for its OPV bid, while Fassmer has teamed with Austal. Just last week, AustalFassmer was in Brisbane continuing an industry engagement series presenting the AustalFassmer joint venture bid for the Australian government’s $3 billion OPV project, while Lürssen was in Cairns for an industry briefing.